The lava tube caves found here were created by flows of smooth lava 10,500 to 65,000 years ago. As the lava flowed it began to cool and solidify on the top and sides. Once the eruption ceased, the tube emptied and drained, and a new lava tube cave is left behind. As the rock cooled, the inner surface of the tube cracked and collapsed, producing openings to the surface. Many of the developed caves contain trails through the cave, stairways or ladders into the cave. Most of developed caves are located along Cave Loop, a 2 mile road near the Visitor Center. 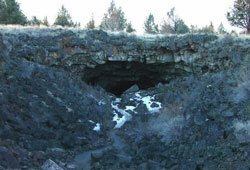 Just a short walk from the Visitor Center, Mushpot Cave contains exhibits and is the only lighted cave at Lava Beds. Developed caves are divided into three groups based on their varying levels of difficulty in the hardest section of the cave: least, moderate and most challenging.